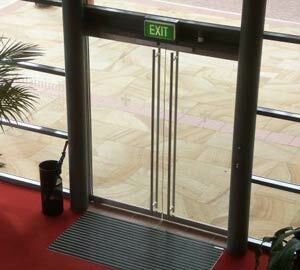 The opening of doors can be extremely difficult for many people with disabilities. Many doors require excessive forces to push/pull the door open. 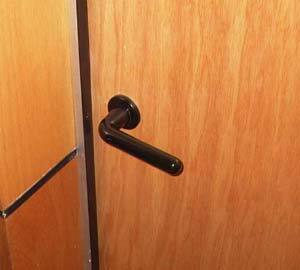 Often incorrect door furniture is used that does not allow people with hand or arm impairments to effectively operate the door mechanism. 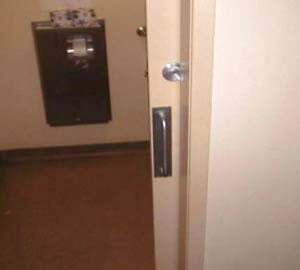 This is especially so if a door closer is attached that does not meet the appropriate specifications. If the door is of a heavy construction or is located where the wind pressure may make opening difficult it may be most appropriate to fit an automatic door opening system. 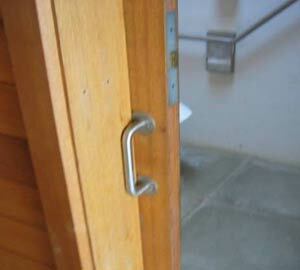 An additional issue is that of the type of handle used on the door. Round door handles do not allow people with a disability that affects hand or arm function to operate the latch mechanism, hold it open and then pull/push a door open, as the degree of grip required to keep the handle in the open latch position is difficult for many people with disabilities. The Building Code of Australia (BCA) D 3.3(c) is relevant to door opening requirements where it refers to and requires compliance with AS1428.1. AS 1428.1 specifies technical details such as location, dimensioning, forces and design criteria. To be effective the pressures required to open and close doors should not exceed those specified in AS 1428.1. Similarly in order to be effective door handles must be within the design criteria set out in AS1428.1. Correct location and height above the finished floor. 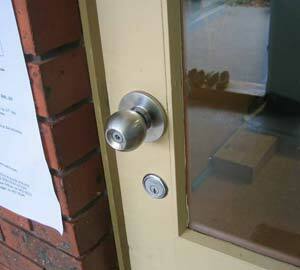 Use of an appropriate door handle. 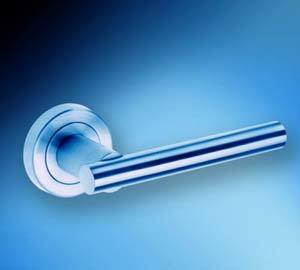 Clearance behind the handle to reduce the risk of hand or wrist entrapment and correct clearance from the door jambs. While AS 1428.1 refers to lever type handles the Commission’s view is that the preferred type of door handle is the “D” type lever handle, which allows a person to operate the latch mechanism with minimal effort. The return on the “D” type lever handle keeps the hand from slipping off the lever and assists in opening the door when being pulled open. Recessed finger grip handles used on sliding doors cannot be used by many people with disabilities, while “D” type pull/push handles make the opening/shutting task a lot easier. Minimal clearances of the door handles on sliding doors from the door jambs must be maintained in accordance with AS1428.1 to ensure that knuckles are not damaged when the door is being fully opened or closed. 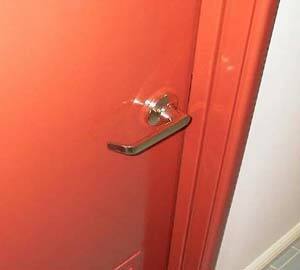 Access can also be improved by having good colour contrast of the handle to the door. Photos 2 and 3 show larger manual doors that are often used that can exceed the maximum required force as set out by AS1428.1. 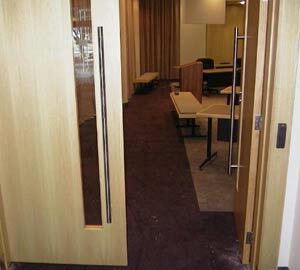 To overcome this issue electronic door opening systems may be used. Photos 4 and 5 show “L” type lever handles. “D”-type lever handles are preferred as they provide the added advantage of reducing the risk of a person's hand slipping off the lever when operating the latch and opening the door. 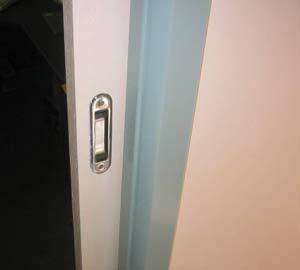 The recessed sliding door handle and door knob shown in photos 6 and 7are extremely difficult for people with hand, wrist or arm disabilities to use due to reduced dexterity and strength. 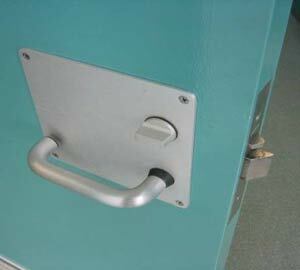 The “D” type lever handles in photos 8 and 9 are very user friendly for people with hand, wrist or arm impairments. Note the set out from the face of the door is such so as not to cause hand or wrist entrapment. Minimum clearance of the door handles from the jambs shown in photos 10 - 13 has not been achieved in accordance with AS1428.1. 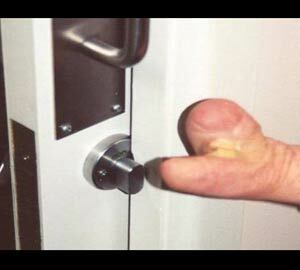 This can result in injury to the knuckles when the door is opened or closed.